©Copyright: All rights reserved by Krishna.me. Thank you for visiting this website. Please be sure to read these Terms and Conditions carefully since any use of this website constitutes your acceptance of the Terms and Conditions set out here. ‘Content on the website’ includes but is not limited to photographs, illustrations, images, audio, video and text in connection with this website and the websites of any of my subsidiaries and trading styles. All copyright and other intellectual property rights in all text, images, audio, video and other materials on this website are the property of Krishna.me or are included with the permission of the relevant owner. The logos displayed on this website belong to Krishna.me or appear with the permission of the relevant owner. Nothing contained on this site should be construed as granting any licence or right to use any logo displayed on this website and the use/misuse of them, except as provided for in this Copyright Notice, is strictly prohibited. Printing, copying and/or downloading of the Content on the website is permitted for personal and non-commercial use only, provided that the content and context remain unaltered, and Krishna.me are fully credited as the source. 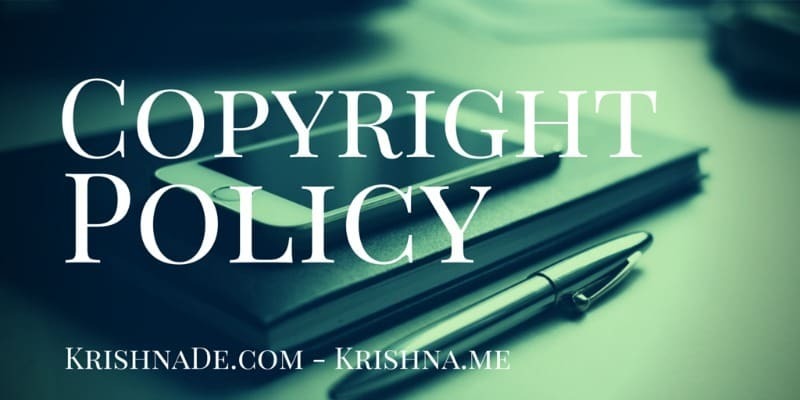 Republishing, distributing and/or copying any portion of the Content on the website is prohibited except for purposes of quoting from or citing as an example of, the site’s content as long as Krishna.me’s copyright is acknowledged and full citation included. The Content on the website is protected by UK, Irish and European Union copyright laws and other international copyright laws and conventions. The use of the Content on the website for purposes other than those permitted pursuant to the rules relating to the usage of this website is prohibited except where express written authority has been obtained from Krishna.me. Krishna.me reserves the right to revise, amend, or modify this policy and other policies and agreements at any time and in any manner. Please refer to this page from time to time to review these and any new, additional or revised information.